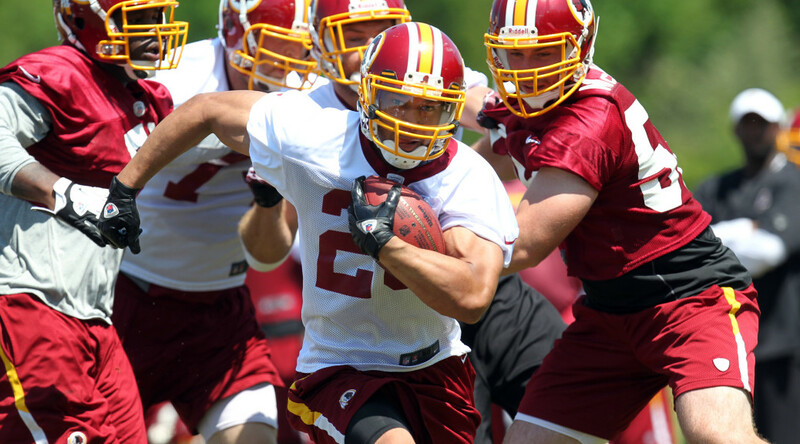 The Oakland Raiders Sign Former Washington Redskins Running Back Roy Helu Jr.
ALAMEDA, Calif. – The Oakland Raiders have signed unrestricted free agent Running Back Roy Helu, Jr., the club announced Wednesday. Helu, Jr. has spent the previous four seasons with the Washington Redskins. He appeared in 48 games with five starts over his tenure with Washington, rushing for 1,132 yards on 255 carries (4.4 avg.) and seven touchdowns. Proving a versatile pass catcher out of the backfield, Helu, Jr. has added 1,152 receiving yards on 129 receptions (8.9 avg.) and three touchdowns. Since 2011, his 8.9 yards per catch rank seventh in the NFL amongst all running backs. The 5-foot-11, 215-pounder burst onto the scene as a rookie in 2011, rushing for 640 yards and adding another 379 receiving yards. For his efforts, he was named to the Pro Football Writers Association’s All-Rookie Team. Last season, Helu, Jr. set a career high with 477 receiving yards, an 11.4 receiving average and two receiving touchdowns. He led all Washington running backs in receiving yards in 2011 and 2013-14. A native of nearby Danville, California, Helu, Jr. was originally selected by the Redskins in the fourth round (105th overall) of the 2011 NFL Draft out of Nebraska. He played in 48 career games for the Cornhuskers from 2007-10, making 28 starts and totaling 578 rushes for 3,404 rushing yards (5.9 avg.) and 28 touchdowns. He attended San Ramon Valley High School in nearby Danville, Calif., where he earned All-East Bay League honors in each of his final two seasons. Roy Helu signed a 2 year / $4,000,000 contract with the Oakland Raiders, including an annual average salary of $2,000,000. Q: How appealing is it to come back home to play in the Bay Area? Q: Did you talk to Jack Del Rio or Bill Musgrave about how you can contribute here? Q: When you get drafted by a team run by Mike Shanahan, people tend to see you as a zone runner, yet the Raiders are talking about running a power scheme. How do you think your skillset fits into that? Q: You seemed to blossom as a pass receiver last year. Is that something you’ve been refining since you got in the league? Q: Coming to a team without a winning season since 2002, all of the free agents we have talked to have discussed the positive vibe around the building. What is it about what you are hearing from the coaches that makes you think you’re going to be a part of turning something around here? Q: There is talk the Raiders might be in the mix for running back DeMarco Murray, somebody you’ve seen a couple of times a year. As a running back, would you welcome bringing another great running back in?